... 1976 (35 years ago today), a woman who'd tried 4 months earlier to assassinate President Gerald Ford was sentenced to life in prison. U.S. District Judge Samuel Conti deemed her behavior "'a product of our times, a product of a permissive society,'" and in giving her the maximum possible term, asserted that the defendant, Sara Jane Moore (left), "a one-time F.B.I. informer and would-be revolutionary," would never have shot at the President as he left San Francisco's St. Francis Hotel "'if we had in this country any effective capital punishment law.'" (photo credit) (Conti, an appointee of President Richard M. Nixon, currently serves as a Senior District Judge in San Francisco.) 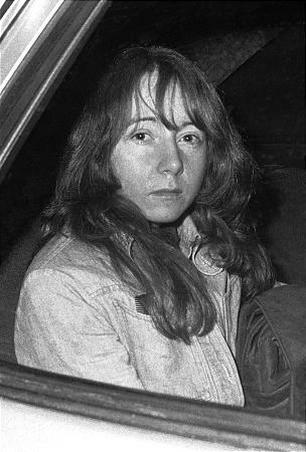 Moore's life sentence followed another given the same month to another woman, Lynette Fromme (right), a Charles Manson devotée who, like Moore, had tried to assassinate Ford the prior September. (photo credit) Moore would be released on parole in 2007, at age 77; Fromme's parole followed, in 2009, when she was 60 years old.